We went to Seven Feathers this morning for our wedding Anniversary and I won $224 on the penny slots. We stayed there all day and looked around the gift shop. Ate our lunch at the all you can eat buffet. We walked around the whole area and than remembered I forgot my camera. But that is ok we will be back once more this year. So I will take pictures than to share. We decided to go to Sizzlers tomorrow and just come home. The kittens are one year old today. Wow, sounds like you had a fantastic day! Congrats on winning! I love all you can eat buffets, especially Chinese/Japanese. This was a seafood one. And I love seafood. @jstory07 A seafood buffet? I've never been to one of those. I love seafood as well. I like fried shrimp, fried oysters, flounder or perch, fries, hushpuppies and a lot of good tartar sauce! @AngelizaQT They had everything that you could think of and lots of bread and deserts. I guess the kittens are at a gawky age at the moment. Congratulations on your wedding anniversary. The kittens are still playful. We always do something special on our anniversary. @jstory07 It's good to mark anniversaries in some way. @JudyEv We do something every year. It was your lucky day! Now you can really celebrate your anniversary in style! Happy Birthday to the kittens. Nico will be one year old in June. I am still working on getting him a buddy. He has calmed down a bit thankfully. These two kittens are always up to something. @jstory07 Nick is an avid nature watcher! Is Seven Feathers a casino? Well done for winning all that money. Yes it is a casino run by a tribe of Indians. Happy Anniversary, I am glad you won, a great way to celebrate. Yes it was. We had lots of fun. You are the big winner! Yes I will not play anything but the penny slots. Wow, you got those kittens on your anniversary, did you make them a birthday cake? Happy Anniversary. No my husband is on a diet. They have to many toys and lots of food. Wishing you a HAPPY WEDDING ANNIVERSARY. Thank you we had a great day. The lunch was great and the day was great. Thank you it was a good day and all good years with my husband. We do everything in the morning. So I come on late. I hope the cats are friendly to my three grandchildren that live in Europe. They will be here the second week of June for a week. @jstory07 I exercise in the morning, but had so much to do for days with my husband. It interfered with my myLot time, but life calls. You must be so excited to see the kids! I'm sure the kitties will be fine. 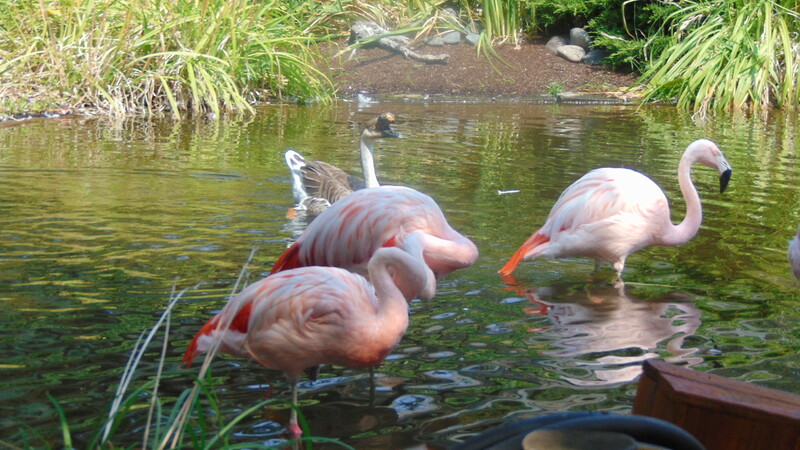 Yes they are Flamingos. They are at the zoo.